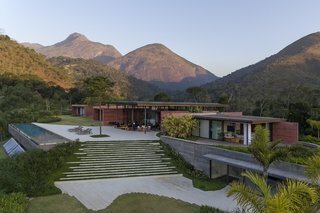 When architect Thiago Bernardes of Bernardes Arquitetura first visited his client’s property in the Brazilian mountain town of Itaipava, he was instantly taken by the reddish color of the surrounding terrain. 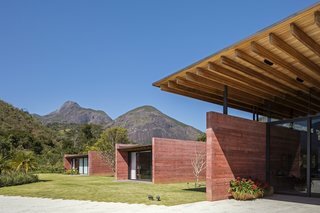 That immediate attraction sparked the idea for the red-colored concrete walls that define Casa Terra, a 10,765-square-foot vacation home that takes its name from its earth-inspired appearance. The massive roof was constructed from glue-laminated timber. 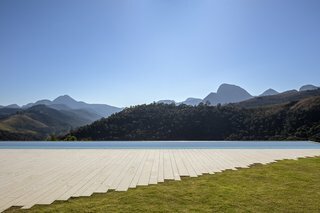 Commissioned by a family of four, the weekend retreat is located on the highest point of the property and overlooks valley views and the mountains beyond. An inorganic pigment was added to the cement mix to give the board-formed concrete walls its reddish hue. 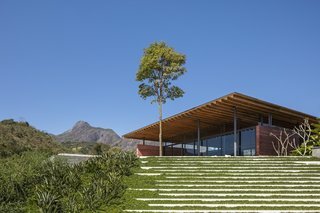 Lush greenery surrounds Casa Terra to make the building feel like an extension of the landscape. 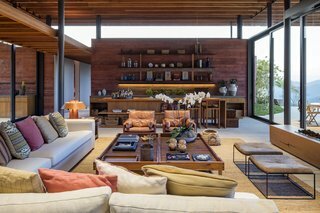 To bring uninterrupted views into every room, Casa Terra is organized along a central axis that stretches east to west for nearly 200 feet. 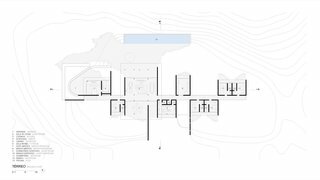 The five en suite bedrooms, shared living spaces, and service facilities are delineated with parallel concrete walls that extend perpendicularly from the central circulation axis in an alternating pattern. 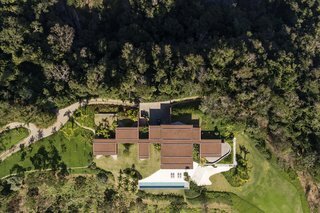 An aerial view of Casa Terra clearly shows how the various rooms branch out from the central circulation axis. 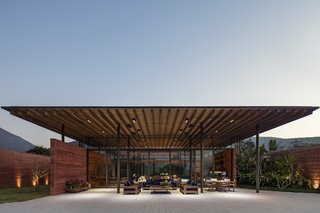 "The articulation between these components generates spaces while defining residential functions and creating patios that open to the main garden," explains Bernardes Arquitetura. 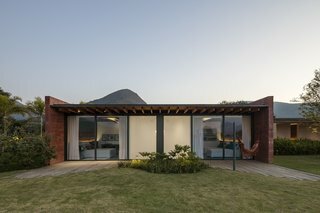 Glazing on both sides gives the television room an airy, pavilion-like feel. 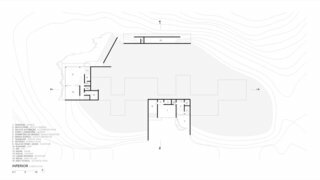 "The closure between the vertical (walls) and horizontal (slabs and floor) panes is made with large glass panels that dilute the visual boundaries between the house and the landscape." An east-facing view of the central circulation hallway is flanked with full-height, dark-gray anodized aluminum windows. 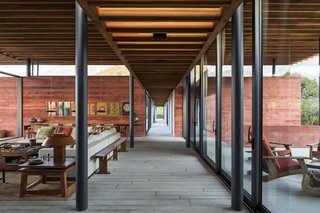 The outdoor landscape is brought indoors through the continuation of the red concrete walls and ample glazing. 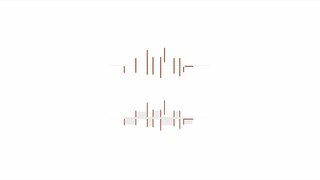 "The route along the central circulation reveals a succession of openings and closures, while offering constant visual contact with the exterior." The veranda on the southwest side of the home is shielded from the elements by the roof. 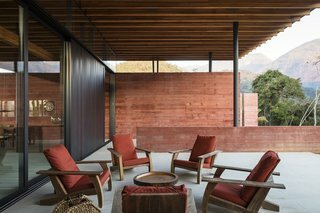 The chairs upholstered in red fabric match the pigmented concrete walls. Spaced-out pavers are laid down on the slope leading away from the east-facing veranda. Paving with a jagged edge connects the living room to the pool in the northeast section. 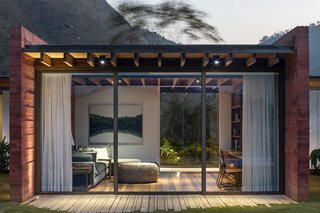 Sliding glass doors open the bedrooms to their own private patios; the opaque walls conceal the bathrooms. 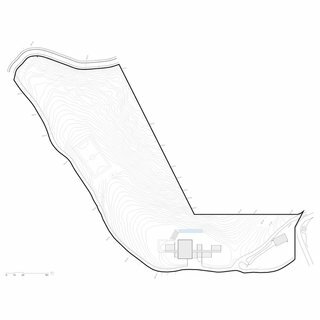 The sloped site plan of Casa Terra. 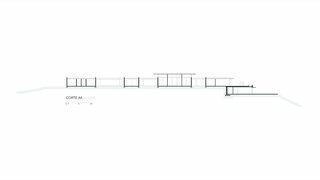 Here's the floor plan for the first level of Casa Terra. A look at Casa Terra's lower-level floor plan. A section of Casa Terra. This diagram looks at how the home is organized along a central axis.